A Life of Sugar and Spice: Pancakes! A little while ago I met my girlfriends for breakfast at The Friendly Toast in Cambridge, MA. Of course before we went I checked out the menu online and was so excited to see that they offer gluten-free pancakes!! I'm a huge breakfast fan and most of the time you'll find me eating eggs over easy and bacon, so I was looking forward to a change of pace. 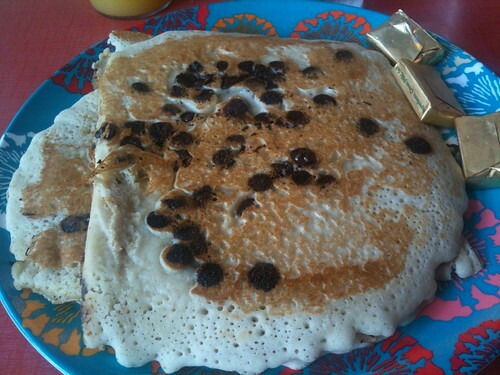 Before we ordered, we were checking out the other diners' plates and I could see that the pancakes were huge! You can order 1 cake, 2 cakes or 3 cakes and add blueberry crumbles, toffee chips or chocolate chips, they also have specialty pancakes like coconut cakes, king cakes, and pumpkin (not available GF). I was curious about the size compared to the "real" ones so I asked the server. He said they are just as round, but a bit thinner based on the batter. I said, sign me up for 2! (And a side of bacon please!) These pancakes were so delicious, I couldn't even finish half of my plate. Unfortunately I said no to a to-go container thinking I didn't want to have the calories later but I wish I had taken them home. I can't wait to go back, next time I'm getting one cake and a side of home-fries, I stole a few from my friend Katie and they were unbelievable! All the girls ordered something different and everyone was picking off each others plates, the servings were massive! I definitely recommend this place, but be prepared to wait to get in, it was featured on Travel Channel's Man vs Food Nation, and also Good Morning America. There is always a bit of a wait, the restaurant has a funky vibe with lots of retro decor and really cool staff. I can't wait to go back!! YUM. I forgot about the Friendly Toast! I've been to the one in Portsmouth before, and only been to the one in Cambridge once - i NEED to get those choc chip pancakes! Allie I think they do serve all day, we should meet up for pancakes in cambridge!!!! Jen - I am DOWN. Let's do it! I work in cambridge you know, in harvard square, but I've only got 3 weeks left until the baby comes!